Save on installation cost and panel space with Insight's NEW True Flow 500 Sensor Computer with GPS interface. True Flow 500 is a new concept in fuel flow computers. True Flow 500 is designed to give pilots a simple and efficient way of reading fuel information directly on the GPS fuel pages. True Flow 500 eliminates tedious installation and set-up procedures that are required for other fuel flow computers. Install True Flow 500 on top of the engine and connect fuel lines, GPS power, ground and RS232 RX input. There is no K- factor to set-up, no switches to turn and no jumpers to remove or add. Turn on the GPS, enter total fuel on board and immediately you will have accurate fuel information. 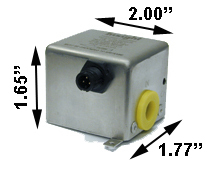 True Flow 500 computes fuel flow rate only and transmits data through a serial interface directly to the GPS. All other fuel functions are calculated by GPS. True Flow 500 communicates with the GPS using well known serial protocols that are supported by most of the general aviation GPS manufacturers. First fuel flow computer that does not use up valuable panel space. First fuel flow computer with automatic compensation for K factors. (no calibration required). 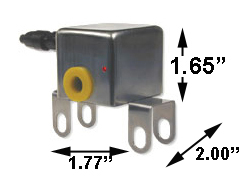 First fuel flow computer to providing a visual indication of both power and flow rate (LED). 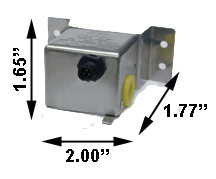 Simple and short installation reduces installation cost to a fraction of what is typical for other fuel flow computers.